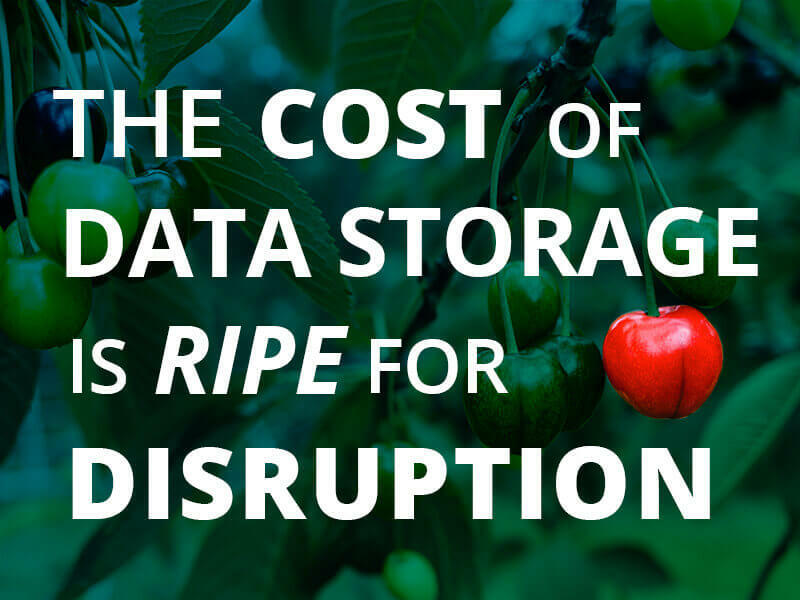 The cost of enterprise data storage is long overdue for a reset. Think about it. Not only is the sheer amount of data that your business generates increasing, but the potential value of that data to your business is increasing too. As a result, it no longer makes sense to purge large amounts of old data as a cost saving measure, nor can you easily relegate much of your data to a low cost, low performance, and low accessibility means of storage. At the same time, neither IT budgets nor manpower are increasing, but it’s still your responsibility to make sure your organization’s data is always available. In this respect, failure is not an option despite the many challenges involved. Meanwhile, the legacy enterprise storage vendors are ruthlessly committed to sustaining their current business models and pricing (and viability on the NASDAQ). These days they are dropping SSDs into the same old storage arrays (because performance is the only thing that matters, right?) and declaring it “the year of all flash” (which by definition could be taken to mean “the year of being all lacking in substance”). This is what passes for innovation among the legacy vendors and they are charging their customers a pretty penny for it. Forgive me for using what the New Republic calls “the most pernicious cliche of our time,” but if data storage needs are growing, IT budgets are not, and the legacy vendors are holding steadfastly to the status quo, it would seem that something has got to give — the cost of enterprise data storage is ripe for some disruption. Disruptive pricing and aggressive pricing are not synonymous. Aggressive pricing is often used by vendors as a marketing tactic to make short term gains. An aggressively low price can be used as a wedge for a new vendor to get their foot in the door with you or by your long term vendor to undercut a competitor and prevent you from giving part of your business to a more innovative up-and-comer. The potential for savings from aggressive pricing can have great appeal for IT leaders with limited budgets. Ultimately, however, this kind of pricing strategy can be bad for you and bad for the vendor. If your vendor is buying your business, you’ll probably be paying for it later. You may end of paying in the form of ‘optional’ professional services, software add-ons, or added fees for premium support. If you are dealing with one of the big boy vendors, you may even find yourself paying for it in some obscure line of your ELA that has nothing to do with storage at all. If you’re not “paying for it later” then you may be taking on the risk of doing business with a vendor who hasn’t figured out how to grow and turn a profit simultaneously. If your vendor is losing money with every sale, over time it may become limited in its ability to invest in the platform or provide meaningful support. A vendor who can’t run a profitable business may find itself being sold to a rival, a transition that is always fun for customers, or putting a closed for business sign on the door permanently. For more on some of the more troubling aspects of dealing with technology vendors who are governed by a growth at all costs philosophy, see this recent article in CIO magazine, but let’s get back to disruptive pricing. The truth is that for pricing to truly be disruptive, it must also be sustainable. And for disruptive pricing to be sustainable, both customers and vendors need to achieve lower costs. With disruptive pricing, the customer gets the benefit of savings in that they can store more and do more with their allocated budget and the vendor can eke out enough profit to continually reinvest in the platform, invent valuable new products and services, and deliver meaningful support (you know, the old fashioned kind where you get to deal with an actual, qualified human being who knows and cares about your business). To enable disruptive pricing that helps both customers and vendors save on their costs, some innovative thinking and engineering are required. This can be more easily accomplished in the mid-market where scale is less of an issue and buyers are more willing to accept trade-offs in exchange for lower prices. However, product development teams focused on the enterprise need to think especially creatively about how to lower a storage solution’s cost without sacrificing scale, performance, availability, flexibility or ease-of-use. 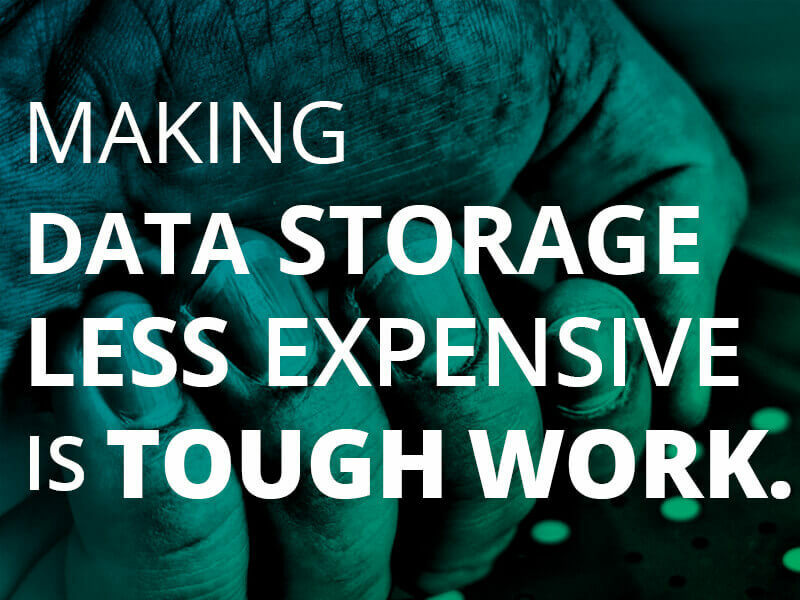 Quite frankly, making data storage less expensive is not a priority for legacy vendors. They are too busy trying to boost their share of wallet and justifying the markup on what is essentially the same old box, recently souped up with some flashy bits. For an explanation of why this is so, please see our post Why Fast, Reliable, Inexpensive Enterprise Storage is an Existential Threat. Figuring out how to maximize density and price-to-performance ratios, determining how to minimize power consumption, orphan capacity and downtime, looking at ways to facilitate storage consolidation, improve ease-of-use and encourage automation, even taking on the reduction of product development cycles — this is where the tough work of making data storage less expensive takes place. At INFINIDAT, disruptive pricing isn’t just a marketing tactic. In fact, improving affordability is intrinsic to the design of the InfiniBox storage solution and making enterprise data storage less expensive is a core mandate of our team. To learn how InfiniBox can help dramatically reduce your total cost of ownership (TCO) when compared against the legacy storage vendors, please download our white paper, Storing the Future: Data at Scale.